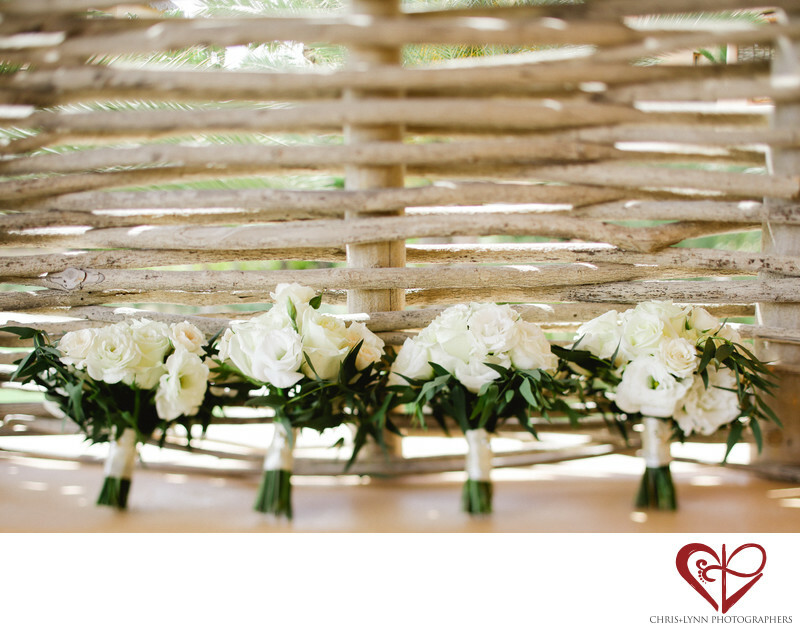 Lined up against a palo de arco fence, these fresh bouquets look amazing! Florist Elena Damy did an incredible job choosing a stunning arrangement of white roses and a base of green leaves. White often symbolizes purity and peace, while green is a symbol of nature, harmony, and positivity. In a single bouquet, these colors work together to create a beautiful floral bouquet. Sometimes, brides carry a different bouquet than their bridesmaids, but in this wedding, all of the ladies carried the same gorgeous bouquet of white roses. This bouquet is simple, yet beautiful. This arrangements matches the lush landscape of Cabo San Lucas and specifically the luxury Esperanza resort. In this photo, sunlight is filtering through the palo de arco, shedding light on the bouquets. We love contrast of light flowers and dark underbrush, which draws attention to the bouquet. 1/800; f/2.8; ISO 200; 45.0 mm.